Sadhguru addresses India’s position in the world and how it can shape the future during an interview, and answers questions about nationalist passions, India’s soft power, peace, yoga and more. 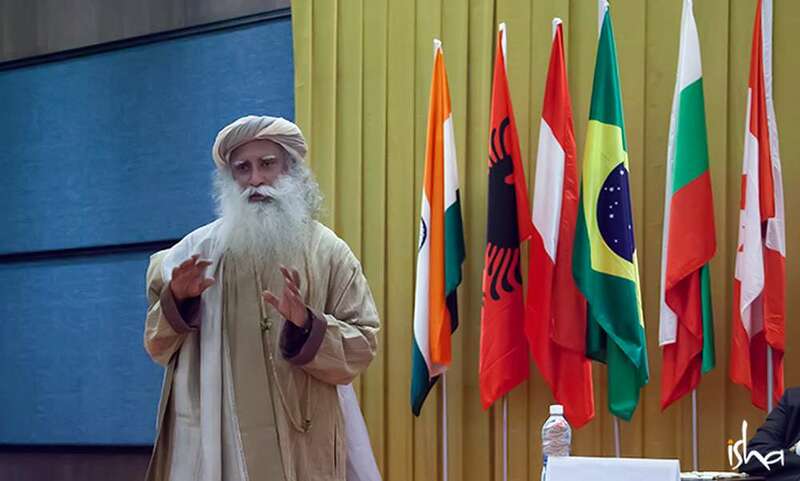 1) Sadhguru, in a world driven with conflicts and crises, how do you see the role of India’s soft power in shaping a more peaceful and harmonious world? Sadhguru: The world is not a globe. The world is its people. If you are really concerned about peace, it takes individual transformation. Peaceful individuals are the building blocks of a peaceful world. So, in our day-to-day lives, we need a culture of peace – how human beings can maintain their bodies, minds, emotions and energy in a state of peacefulness. In this culture, just a few generations ago, everyone had some simple process in their daily lives that took care of their inner wellbeing. Unfortunately, today, if you utter the word “yoga”, people think you have to twist yourself into some impossible postures. No. Yoga, on one level, is a science of creating the right kind of chemistry within. This culture has profound technologies of creating an exuberant, balanced and ecstatic inner situation. We just need the willingness to learn and apply it. Every thought and emotion has a corresponding chemical process within the body. If you are peaceful, the chemistry within you is in certain way. Or, if you can create that kind of chemistry within, you naturally become peaceful. With the right kind of practices, you can bring about a change in the internal chemistry and bring it to a state where whatever the situation, you are always peaceful. Peace and joy are assurances that you will not do unpleasant things. If you are feeling pleasant within yourself, why would you do unpleasant things to someone else? This culture has profound technologies of creating an exuberant, balanced and ecstatic inner situation. We just need the willingness to learn and apply it. If there is one role that the people of this nation must resolve to play, it is to light the way for the inner transformation for the whole world. 2) When we talk about India’s soft power, what do you think are its key components? What is the quintessence of India’s soft power? 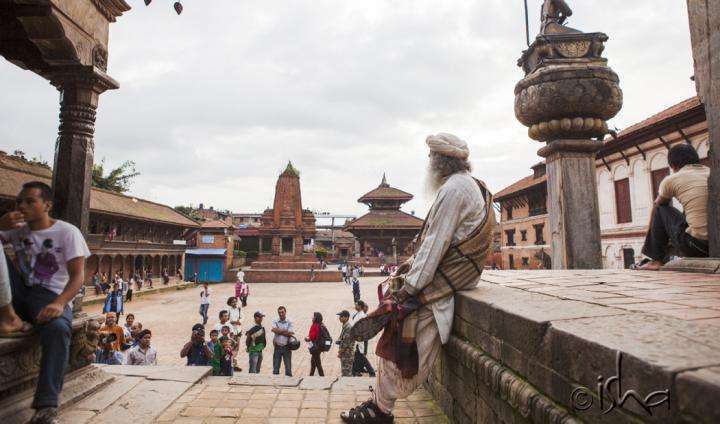 Sadhguru: Nations are created on the basis of race, religion, language or ethnicity. India, however, is a mind-bogglingly complex combination of all these ingredients and more. Sameness has been the basis of the making of nations. India stands in total defiance of this formula. In the past, although we were over 200 political fragments, we were still seen as an entity with civilizational unity. But why was this subcontinent considered one entity? After all, every fifty miles, people look different, speak different, dress different, cook different, eat different – everything about them is different. The reason is this has always been a land of seekers, not a land of believers. This is the essence of this culture. A seeker can never be a believer because you seek only when you realize you do not know a damn thing about life! The most important thing in the world today is to build this culture of individual seeking, not religion. All the conflict on the planet, though some would like to project it as good versus evil, is essentially one man’s belief versus another man’s belief, religious or otherwise. The moment you believe something, you become blind to everything else. However, when you are seeking, you have something to strive for, but nothing to fight for. The world needs this badly. When we fight, we destroy. When we strive, we create. 3) In the last few years, India’s global profile has grown steadily, and along with it, there is a greater recognition of India’s spiritual and civilizational heritage? How do you explain the world’s affirmative response to India’s spiritual values? 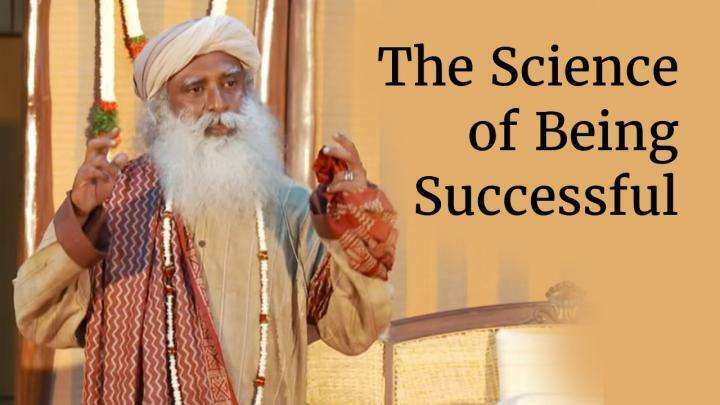 Sadhguru: It was always believed that affluence will bring wellbeing. But in Europe, which has enjoyed many decades of continuous affluence, 38% of the population suffers from mental illness. In the United States, almost 70% of adults are on prescription medication. This is not wellbeing. People today are anxious and neurotic and whatever methods they have been using to handle their internal turmoil have not really worked. So looking towards yoga is very natural. The yogic science is the only technology for human wellbeing which has lived for over 15,000 years. Today, nearly two billion people practice some form of yoga simply because of its efficacy. It works! The fundamental objective of yoga is to make your experience of life so large and all-inclusive that instead of being an individual, you become a universal process. I normally never talk about the benefits, because I consider them as the side-effects of yoga. But there are definitely physical and mental benefits. One can experience remarkable changes in terms of being peaceful, joyful and healthy. And there are many people who have come out of chronic ailments miraculously. But that is not the essential nature of what yoga is. The fundamental objective of yoga is to make your experience of life so large and all-inclusive that instead of being an individual, you become a universal process. To become something more than what you are right now is a fundamental longing in every human being. What you are seeking is boundless expansion. Boundless expansion can never happen through physical means. It can happen only if a dimension beyond the physical becomes a living reality within you. To experience this dimension is the true purpose of yoga. So in that sense, it is only yoga that can truly address human wellbeing. But, one must also understand that the spiritual and cultural dimensions are a lame duck without the nation’s economy and political influence. 4) You have travelled around the world, talking about Indian spirituality and traditions. What are your personal impressions about how the world is responding to Indian values and spiritual traditions like yoga? Sadhguru: Across the planet, I find that doors are opening for spiritual process like never before. Even universities, which are in many ways the last bastion of resistance, are opening up. Academics would never accept mysticism or spirituality as a part of their life. But now they want weeklong sessions every year for their students. And three years ago, International Yoga Day was adopted by the UN after 177 countries co-sponsored the resolution. No other resolution has received such support. It was almost like the whole world was waiting for India to take this step. Human wellbeing will not happen unless one turns inward because human experience is created from within. International Yoga Day means we are looking at wellbeing as a science, not as faith, not as something that happens to you by accident. We are not looking at the stars to fix our wellbeing. We are looking towards a scientific process of creating wellbeing consciously. 5) What should be done to promote India’s soft power? What role do you see for the government and other institutions in enhancing India’s civilizational outreach? Sadhguru: Trying to “promote” or “push” India out is not going to work. We should not bother about who is following or not following us. If we rise and shine, if there is a light, people will definitely come in that direction. We need to invest in creating individuals who will be like a lighthouse to direct people. The hallmark of this culture is developing individual genius. Unfortunately, in the last few generations, we have not invested enough in this. Through the ages, we have produced tremendous human beings. The yogic lore talks about how we produced human beings that gods were envious of. That is the kind of genius this land has produced. That is what we should focus on. If you generate those kinds of individuals in every generation, let us see who can ignore this nation. 6) The last few years have seen the rise of nationalist passions and parochialism? What role do you see for cultural diplomacy in mitigating this polarisation and bridging these artificial divides? 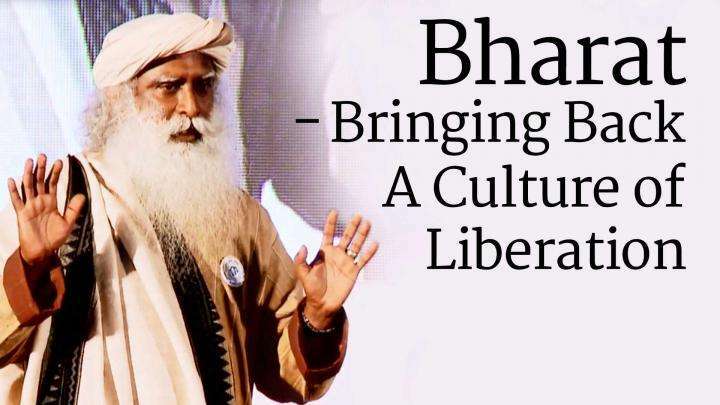 Sadhguru: I am constantly being asked whether India is turning into an intolerant country. As far as I see around myself, in terms of communal and other kinds of friction, I feel we are way better than what we were in the last 70 years. Go to any village or any community: distinctions of caste and community have come down significantly, though still there is a lot to be done. The only thing is, every person today with a phone is a journalist. So, any incident in any corner of the country spills into your living room. Another aspect is that there is a certain insecurity in the majority community because the demographics in many parts of the nation are being actively changed. Nobody wants to talk about it, but in the North-East, Lakshadweep, Kerala, demographic change has happened rapidly in a matter of 30-40 years. If such change happens over a few centuries, then that’s the choice of the people. But when it happens over such a short time period through an active campaign, others will become insecure because you don’t know what will happen to you tomorrow. You can see what is happening because of ISIS, and in Kashmir, where a particular community had to leave en masse two decades ago. So, everybody needs to have the sense to not change demographics rapidly. 7) Do you think soft power can help address the scourge of terrorism and pernicious ideologies that seek to foster it? If so, in what ways? Sadhguru: As I said earlier, individual transformation is the only solution. We must make the world a place where every individual and life will have opportunity to find fullest expression, as that is what propels all life. This culture that we refer to as Bharat has all the tools needed to create a world where there is an inward movement, which will allow every human being to blossom to their fullest possibility, without impeding upon any other life. Whatever the reason these words of instigation got into sacred books, it is time that the sensible portion of people who believe in these books expunge what is not suitable. Only if all religious groups are willing to start looking at the prospect of expunging stimulus for violence from their sacred books will there be a possibility of a solution. We need a revolution of inner transformation, not of external aggression to change others. 8) There are over 30 million People of Indian Origin (PIOs) living across continents. This year, many of them will be coming for the 15th Pravasi Bharatiya Divas in the sacred city of Varanasi. How do you see the role of overseas Indians in preserving and propagating Indian culture and values? Sadhguru: I would say that if you have integrity, there is so much to be done in India. I am focusing on integrity because it has become scarce material in India. What we need in this country is not necessarily dollars. Money is there. We need corruption-free, clear, focused and dedicated people. Today, India is sitting on the threshold of economic prosperity. When I refer to economic prosperity, I am not talking about the stock market. There are 600 million people in this country who have not eaten properly their entire life. If we do the right things in the next five to ten years, we can move this huge mass of people from one level of living to another – not by philanthropy but simply by progress. We are sitting on the threshold and we are on the right track. The problem is, we have been sitting on the threshold too long. Especially when you are on the right track, if you sit there for too long, you will get run over. It is important that we walk and walk fast. So if you think you have integrity, please come and stay in India. There is much to be done. Editor's Note: In the ebook, "Bha-ra-ta: The Rhythm of a Nation,” Sadhguru looks at the past, present and future of this nation, and explores why this culture matters to every human being on the planet. With images, graphics and Sadhguru’s inspiring words, here’s Bharat as you have never known it! Download Bha-ra-ta.